If there is a recurring and ever-present in the path of Joan Miró element, it is the object. He started collecting them almost gather-, continued to represent in his paintings, and then include them literally in his paintings that eventually began to take volume, and so came the sculptures with objects, finally turning fabrics into objects in themselves. “The object is a constant in his work,” said Rosa Maria Malet, director of the Fundació Miró, a constant that, paradoxically, to date had not been of a sample. 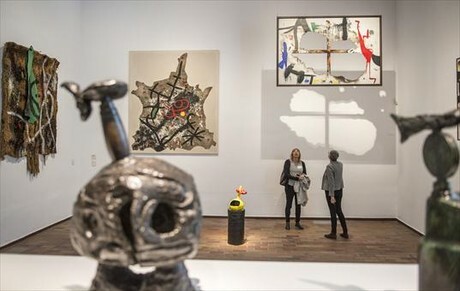 Now the center that the artist thought of Montjuïc spun a whole argument about this evidence in an exhibition entitled, how could it be otherwise, Miró and object, and sponsored by the BBVA Foundation after Barcelona will land in CaixaForum Madrid. The sample (from tomorrow until January 17) brings together 120 pieces among paintings, ceramics and sculptures, covers a wide time span from 1916-1981, and presents new works in Barcelona as toys and Portrait of a ballerina. The latter delicious fabric that belonged to André Breton in which the pigments have been replaced by objects: the dancer is a giant pin and clothing, a pen. The piece was made shortly after Miró proclaimed its intention to “assassinate painting” and after internalizing the famous phrase of Lautreamont that so fascinated the Surrealists: beautiful as the chance meeting on a dissecting table of a sewing machine and an umbrella. The dancer looks in the sample compared to the first painter assemblies built in 1931. Parts created from bones, cardboard, nails, sand and cogs’ are so fragile that is almost a miracle they survived, “notes William Jeffett, curator of the exhibition. But before opening their fabrics to objects, Miró opened their study. The artist created a kind of imaginary museum in his workshop with crib figures, Mallorcan whistles, tools, children’s drawings, puppets … that served as inspiration: “I only use the objects you encounter; the gather everyone in my workshop, which is great. Put objects around on the floor, and I choose that or that other “he said. In the exhibition, a display-style cabinets merveilles surreal exhibits some of these objects, including a plate holder that appears in the ear of wheat, 1922, one of the two still lifes coming from the MOMA in New York and they are the first pictorial representation of objects by Miró. A further step in the growing universe “objetual” Miró was the incorporation of collage in the early 30s, which eventually led to the use of unusual materials conglomerate, metal, fibrocemento- as pictorial support and eventually turned parts Art objects. There are hanging or ironing board brush covered by Miró in the 50 Sometimes he did was to combine found objects to create new “Everyday elements, seemingly inconsequential, made them a new life , a new being, when combined to shape a woman, a character, a monument “Malet says. It example spoon and box mark the hours on the clock wind. The latter, one of the many bronze sculptures that Miró made in the 60s and that combined with his efforts to turn the paint object. Meta getting his lacerated and burned fabrics closing the sample. An exhibition “Miró explores the desire to build from visual metaphors objects,” concludes Jeffett.